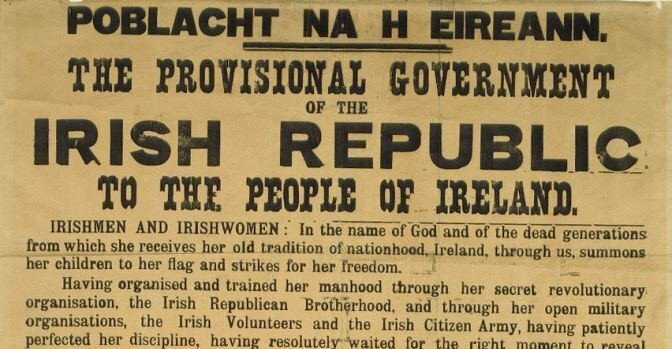 It has been one hundred years since the heroic Easter uprising of the IRB (Irish Republican Brotherhood) and the ICA (Irish Citizen Army) against the might of the British Empire in 1916. The planning of the 2016 commemoration was thrust into the hands of the conservative Fine Gael/Labour government who would have been at least a bit uneasy about the potential for increasing the political support base for the more politically radical Sinn Féin. 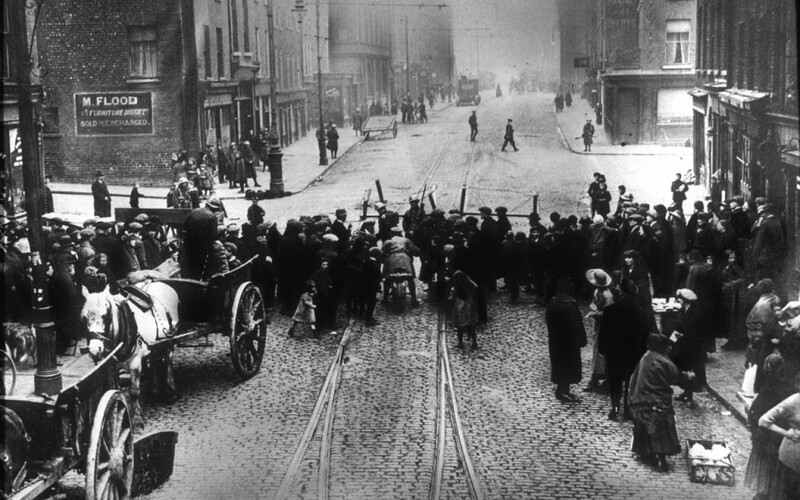 However, the problem of artistic representation of the events was at least partially resolved by the well-worn techniques used by successive conservative Irish governments over the years since the Easter Rising: mythologisation, diversion and counternarrative. The fact that there is still no major monument representing the leaders of the 1916 rebellion in a realist or social realist style (unlike the sculptures of the constitutional nationalists Parnell and O’Connell that top and tail O’Connell St in the centre of Dublin city) is not just indicative of the passing of time and the change in artistic trends. Social realism as an international movement arose out of a concern for the working class and the poor, and criticism of the social structures that kept them there. As an artistic style, social realism rejected conservative academic convention and the individualism and emotion of Romanticism. It became the chosen style of artists, writers, photographers, filmmakers and composers who wished to document and highlight the harsh realities of contemporary life. In the context of 1916, artistic representation presented a political dilemma for elites. How do you portray events that essentially forged current political independence yet potentially could also destroy that power if the masses decided to bring its ideals to full fruition? The answer was to proceed tactically. Mythologisation allows for representation to be distanced from the actual events, diversion focuses attention on less important aspects of the events and counternarrative sets up alternative, less threatening or even completely oppositional views of the same events. Christian ideals, legend and revolutionary nationalism come together in the best known and most artistic of all 1916 monuments, the statue of Cu Chulainn [sculptor Oliver Shepherd] in the General Post Office, Dublin, headquarters of the Rising. It depicts the legendary hero of ancient Ireland bravely meeting death, having tied himself to a stone pillar to fight his foes to the last. Although originally modelled as an exhibition piece in 1914, before the Rising had taken place, it was subsequently deemed to be the most suitable symbol of the event partly because the Cú Chulainn legend was perceived by Patrick Pearse as embodying ‘a true type of Gaelic nationality, full as it is of youthful life and vigour and hope’. The religious feeling invoked by its similarity to the Pieta theme in the pose of the figure also coincided with Pearse’s own ideology which fused Christian ideals with revolutionary nationalism. As swans, the children had to spend 300 years on Lough Derravaragh (a lake near their father’s castle), 300 years in the Sea of Moyle, and 300 years on the waters of Irrus Domnann Erris near to Inishglora Island (Inis Gluaire). To end the spell, they would have to be blessed by a monk. While the children were swans, Saint Patrick converted Ireland to Christianity. It is interesting to note that the original design was to include ‘busts of prominent patriots in niches’ but while the proposal was approved ‘the project was deferred’ [p. 158]. For the IRB, Irish nationality had nothing to do with religion and nationality superseded all sectarian divisions. The question was Ireland against England, not Catholic against Protestant. It was defined not by blood or faith, but by commitment to this world view. In fact, several of the most prominent republicans of the early 20th century – notably Bulmer Hobson and Ernest Blythe, were Ulster Protestants. The Christian emphasis has also been shown in the choice of Easter in March (a moveable feast) for the days of the 2016 commemoration rather than on 24–29 April, the actual dates for the Rising in 1916. Colin Teevan [the writer] made the ambitious choice to have the fictional characters as the main dramatic drivers, while the Rising’s familiar protagonists operate on the sidelines. […] Brian McCardie, with the Edinburgh burr of James Connolly, makes one dramatic entrance; Countess Markievicz (Camille O’Sullivan) gets just a single, hammy scene. 1: Key Characters Were Not Brought Convincingly To Life. One of the pivotal scenes in the final episode was the execution by firing squad of James Connolly. Yet the socialist leader had been thinly-sketched and viewers will have greeted his death with a shrug. We never really knew him – why did we care that he was gone? And did RTE have to slap a Six Nation countdown in the corner as he was sent to his maker? Historians will also surely quibble with the portrayal of De Valera as fascist sociopath. Such actions against the counternarrative and the popularity of the commemorations show that the consciousness of the 1916 ideals are alive and well in the general populace. A similar consciousness among cultural creators in Ireland, dealing directly with the many social, economic and political problems in Ireland today will go a long way towards reaching those ideals.